"Starting a home craft business"
Yes machine knitting is the quickest way to knit and can be very profitable. The machines today are just amazing. You can knit anything from a tiny pair of booties (standard gauge) to something quit large like an afghan on a chunky knitting machine. You can be fast and basic or slow and intricate. You can knit solid colored items or multi colored, stitches can be straight stockinet, lacy or cables. Yes you can knit cables, fair isle and even lace on knitting machines. But no one machine will do everything. 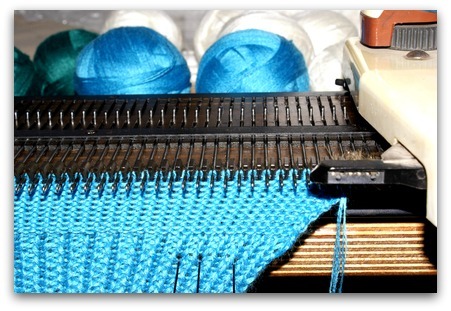 There are so many choices for machine knitting, from a manual knitting machine (basic) to the computerized. 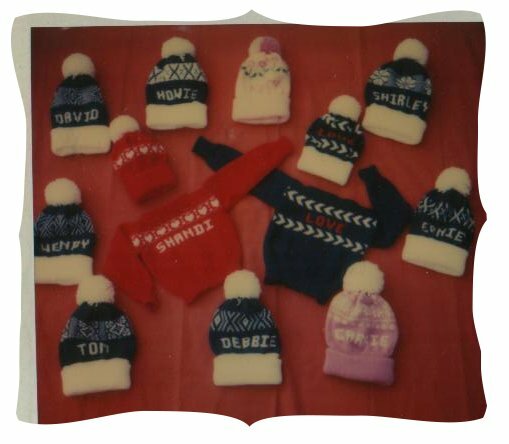 The brands of knitting machines vary from the Bond Incredible Sweater Machine (ISM) to the Passap, very complex and very expensive. 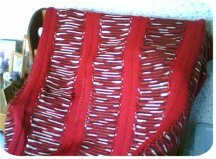 What type of knitting machine to buy? Yes there are many types and styles to choose from. You need to have an idea of what you plan to use it for and what your budget is. If you are wanting to earn a living with machine knitting, it is best to at least get a machine with a 24 stitch punch card design features. I started with a used Brother KH 260 and it lasted for years. I got my money back on it many many times over. Today is more difficult to make a full time living with machine knitting than it was years ago. But you can still make some nice extra income and remain a stay at home Mom. I have always owned Brother brand but Knit King is the same. One is a standard gauge with punch card, another is a bulky knit with a punch card and I also have a KX 400 convertible. This is very basic with no punch card. But it does go from standard gauge to bulky. It’s like having two machines in one. I must admit even though it is not a punch card machine, I do favor my KX 400. It is light, works as two machines and so easy to use and move around. I have knit many items on this little KX 400. Also I made the great mock cable afghan on this one. (Link to pattern here) This afghan makes up fast and it looks fabulous. This is a wonderful Christmas gift idea. This afghan is very basic but with the yarn used and the mock cable, it is very pretty. And looks a great deal harder than it is. Variegated yarns can play a big role in your pattern choice. The variegated colors can make up for the lack of fancy stitches when you first began. This afghan is a perfect example of that. Shop Super Saver Stripes Today! Unfortunately, Brother no longer makes knitting machines. But you can still find them around used. I bought my little KX 400 from (Link here) and have been very happy with both the seller and the machine. If you have never knit on a knitting machine and will be teaching yourself, I recommend a basic machine to get started. 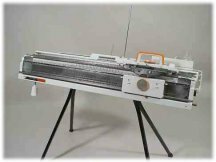 The electronic or computerized knitting machines can be a bit intimidating at first for the beginner. 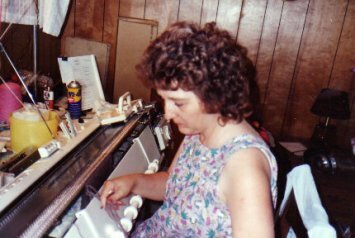 I have made most of my money with my standard punch card knitting machine, in my home business. Machine knitting is not only profitable but it is a great deal of fun. (And girls just wanna have fun). Ok I am showing my age here. But don't get discouraged as you can still earn when you use a basic machine. As you grow and get more of a customer base, upgrade your machine. I do not recommend going into debt if at all possible. That just puts an added burden on you. I love all types of knitting and knitting machines. They can make a hobby very profitable. Do not let the nay sayers stop you. There have always been people seeing the glass half full or the earth flat. Home craft business questions and ideas.